Doggie Chaise Longue | Vavoom! This is a fun product that looks good in any house and it works for you AND your dog! 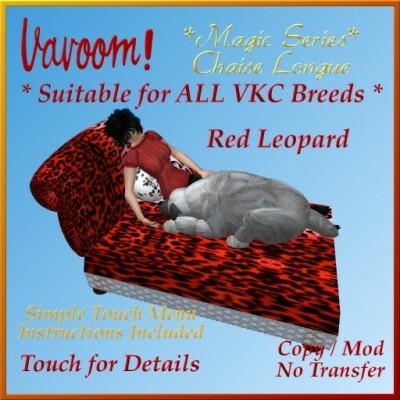 When you touch the Chaise it displays a menu with the names of any VKC dogs in range. When you choose a name from the list, the dog comes over, hops up onto the chaise and lies down beside you. The Vavoom! Chaise Longue works with all the current VKC Breeds. Yes, even the Hyenas can get up onto the chaise with you! If you have one of the old versions that doesn’t work properly with larger dogs and doesn’t have the menu system, please come over to my Update Stations at Turing Isle and grab yourself a copy of the latest version.